از پیامد‌های افزایش جمعیت انسان، افزایش مصرف منابع و کاهش تنوع‌زیستی است. روند فزاینده نرخ انقراض موجب شد انسان به منظور استفاده از ارزش‌های سودمند و ذاتی گونه‌ها اقدام به حفاظت از آن‌ها نماید که نتیجه این کار شکل‌گیری مناطق حفاظت شده بود. پژوهش مذکور با هدف زون‌بندی منطقه شکار ممنوع الوند به منظور دستیابی به الگوی بهینه حفاظت و توسعه به روش ارزیابی چند معیاره با استفاده از روش تلفیق لایه‌های اطلاعاتی با ترکیب خطی- وزن‌دار در محیط سیستم اطلاعات جغرافیایی صورت گرفت. طبق روش دلفی معیار‌ها غربالگری و سپس با استفاده از روش تحلیل سلسله مراتبی وزن‌دهی شدند. 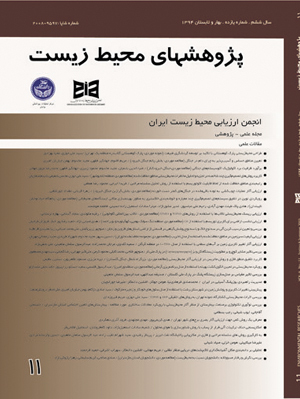 در بررسی نتایج اجرای روش تحلیل سلسله مراتبی در نرم‌افزار Expert Choice الویت وزن نشانگر‌ها به ترتیب در زون 1-2، بیش‌ترین وزن مربوط به نشانگر تقسیمات عمومی اقلیم (1)، در زون 3- 4 و زون 5، نشانگر آثار فرهنگی‌تاریخی (1)، زون 6، نشانگر فاصله از راه‌ها (1) و نهایتا در زون 11، به نشانگر نقاط هم‌دما، جمعیت ساکن و کاربری اراضی (1) اختصاص یافت. در الویت‌بندی زون‌های حاصل شده، به ترتیب بیش‌ترین الویت شامل؛ زون 2 (9/54%)، زون 11 (17/33%)، زون 6 (49/8%)، زون 3-4 (26/2%) و زون 5 (16/1%) می‌باشد. با توجه به الویت حاصل از وزن هر زون، منطقه دارای درصد بالایی از زون حفاظت و همچنین وجود کریدور در بین دو منطقه حفاظت شده و گدار گونه‌های با ارزش قوچ و میش در این منطقه، می‌توان گفت که برای ارتقاء به منطقه حفاظت شده مناسب می‌باشد. From effects of (human) crowd increase, is increasment of consumption resources and decrease of environmental diversity. The increasing approach of extinction rate, caused human for sake of using natural and useful values of species, enterprises to protect them which its result was forming protected areas. present study zoning Alvand no-hunting area in order to achieve an optimal pattern of conservation and development by using The multi-criteria evaluation method, using a combination of data layers combined method (linear-weighting) accomplished in geographic information system area. According to Delfi method, screen criteria and then using the hierarchical analysis method became weighed. In examining the results of executing the hierarchical analysis method in expert choice Software the priority of indicators weight respectively, In zone 1-2, maximum weight related to indicator of general climate divisions (1), in zone 3-4 and zone 5, cultural-historic monuments indicator (1), zone 6, distance of road indicator (1) and finally in zone 11, is devoted to isothermal spots, inhabitant crowd, and lands use (1) Respectively. In prioritization the resulting zone, maximum priority includes, zone 2 (%54/49), zone 11 (%33/17), zone 6 (%8/49), zone 3-4 (%2/26) and zone 5 (%1/16). Regarding to priority due weight of each zone, the region contains high percent of protection zone and also to the corridor between two protected area and gorge of worthful ovis orientalis species, It can be said that the region was of high value for a higher level of protection.